I'm a little biased since they're from my hometown but I'm a big fan of West Aussie Bon Jovi tribute band Slippery When Wet (not to be confused with their namesake in the US). I saw them for the umpteenth time here in Perth over the weekend. Here's a little snippet of the crowd at that gig during "Always", as filmed by their guitarist. That time I met Phil X + Santa Claus is Coming to Town! I hinted in my blog post on the Sydney show that there might be a separate post about meeting Phil X so... here it is. As you may have noticed, Bon Jovi didn't come to Perth on their This House Is Not For Sale Tour. Once I'd got over my indignation, I saw an opportunity to visit Sydney for a week, spend some time with family and friends, and go to their concert at ANZ Stadium on December 8. The day before the concert, Jon Bon Jovi, David Bryan, and Tico Torres were doing a Runaway Tours Q&A, but Phil X was doing a free meet and greet at Guitar Factory Parramatta, so I decided to go meet him. I'm always a bit apprehensive about meeting people I idolise or admire (in case they turn out to be jerks or otherwise disappointing) but Phil was super chill and so nice to everyone. When it was my turn, he asked me my name and introduced himself. I had brought my print of a painting of Phil by artist Jag Lall, and gave it to Phil to sign (along with a gold marker so it would show up against the dark paint). "Did you paint this?" Phil asked. "My friend did it," I replied. Phil autographed the print and got me to hold it up so he could take a picture of it on his phone. One of the staff members then offered to take a photo for me. "We should get the painting in it," Phil said. The staff member took a picture of Phil and me, with Phil holding up the signed print, and it quickly became my top Instagram post of the year. Afterwards, Phil carefully put the print back in its protective cover for me (of his own accord, I didn't tell him to do it, lol). Two sisters waiting behind me borrowed my gold marker, and after Phil had signed their stuff, he handed the marker back to me and thanked me for coming. I thanked him and the staff before making my way back to the city where I was staying. Phil has also released his own version of "Santa Claus is Coming to Town", and the video -- featuring Bon Jovi band members and crew -- was made on the Australian tour. It made me smile, so check it out if you haven't already! Bon Jovi ended the Australian leg of the This House Is Not For Sale Tour in Sydney. I'd spent the week in Sydney catching up with family and friends before going to the concert on Saturday night so it's been a busy few days, but I'm finally home in Perth and writing this blog post. If you have any videos from Sydney you'd like to share, feel free to link to them in the comments. Jon's vocal issues have been pretty well documented by fans over the last few years. But he sounded good by current standards, even if he was kind of running out of steam in the second encore (I'm still glad he did the second encore though). There are concerts where he's been pretty much rooted to the spot and clinging to the mic stand while sounding average, and that obviously doesn't make for a good show. In Sydney, however, he was moving around, working the crowd, and being a front man worth seeing. I had the best time, and I'm really glad I made the trip. 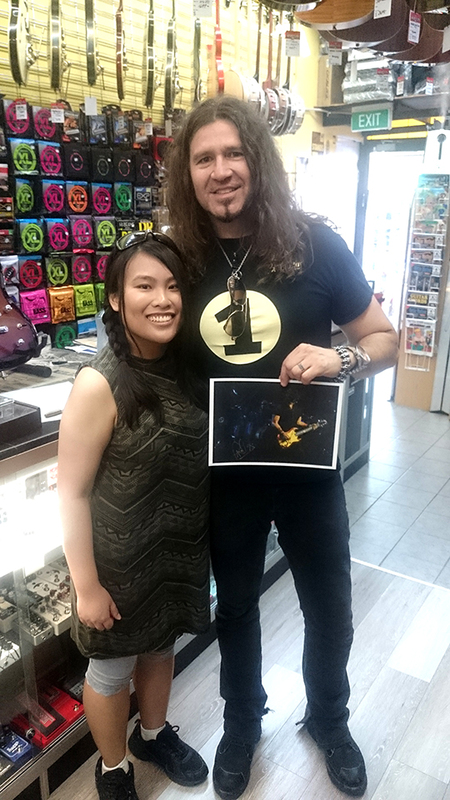 Plus, as I briefly mentioned in my belated Brisbane post, I got to meet Phil X in Sydney... I might do a separate blog post about that? Bon Jovi have announced tour dates for Europe in May, June, and July 2019. The Sydney concert also coincided with a Runaway Tours trip, so there was a Q&A with Jon Bon Jovi, David Bryan, Tico Torres, where it was reportedly revealed a new album is slated for release in 2019. I know this post is much later than usual, but on the day that I would've posted it (December 7), I caught up with some friends who were doing the whole Bon Jovi Australian tour and met Phil X. And then the day after (December 8) was the day of the Sydney concert, which I was attending (and yes, that post is late as well). And the day after that (December 9) I was flying home to Perth. Anyway, Bon Jovi's Brisbane show brought some more surprises with it, including the tour debut of "Last Man Standing". If you have any videos you'd like to share from Brisbane, feel free to link to them in the comments. There's been a marked lack of good videos from this show at the time of typing, but I'll check again later. If you'd like to share any videos from Adelaide, feel free to link to them in the comments. Edit 6/12/18: Videos have arrived! "These two brothers they put on masks and they fought a childhood abuser," Jon Bon Jovi said to the crowd. "They met him in court today and he was sentenced to jail. "We have to protect our children, it's not easy when you have to stand up in court and face your devil. "So for those two brave brothers, my heart, my respect, this is for you guys." If you have any videos you'd like to share from Osaka, feel free to link to them in the comments.